We all normally develop an interest in some subject from stamp collecting to climbing mountains during our lives. In my case I was interested in aircraft from a very early age inspired by the exploits in the air of military aircraft during WW2 when at the age of 11 we were bombed out of our house. After leaving school I was chosen by Armstrong Whitworth Aircraft in Coventry to become an aircraft design apprentice which entailed studying every aspect of aircraft design. You may be surprised to find out what those were. Six of us spent 6 to 9 months in each of the departments such as the design office which decided what sort of aircraft was needed. This idea was drawn in detail in the drawing office who worked closely with the stress office. Then to lofting where we drew the shapes to be cut in the factory to make master templates of components. This was done using 10 H pencils on sand blasted metal sheets about 8 x 6 feet. These were inked in by the tracers. Now to the model shop where the wind tunnel model was made and then tested in the tunnel itself. Back to the stress test area where parts of the design were made and tested to prove the calculations were correct. Finally the flight testing where a full size aircraft was flown for the first time. I worked mainly on the AW 52, a flying wing designed to carry mail around the country. Unfortunately, due to no fault of mine, it crashed. The pilot saved himself using, for the first time in this country, a Martin Baker ejection seat. That’s the days taken care of but I went to night school four evenings a week and spent the weekend doing homework. I lived in Birmingham but worked in Coventry so raced to the station to catch the train to Birmingham. One evening I got there just in time so leapt aboard as it pulled out only to find it was a nonstop train to Derby. Late night! National service caught up with me as I finished my BSc in engineering. It was down the mines as a Bevin Boy or join the Forces. Just the job! Joined the Royal Air Force. Decided not to waste two years as an erk so applied for a commission and was accepted. After 34 years in which I got an MSc in Aircraft design at Cranfield and my pilot’s licence I was retired because at 55 we were redundant. Now what to do? At 55 no one wants you so I decided to enjoy myself instead. Got deeply involved in Ocean Youth Club as a Yachtmaster. This involved offshore sailing a 72 foot ketch and introducing youngsters between 12 and 16 of both sexes to become more competent as a team and in life skills. Also achieved 5 star status as a skier. 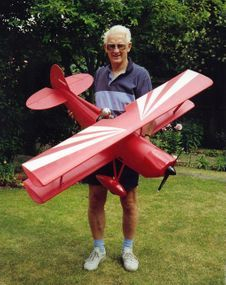 However at 65 one becomes too old for these sports so I turned to model aircraft building and flying them. Also took up Ballroom and Latin dancing which I still do at 85. Now to models, and about time too I hear you say. 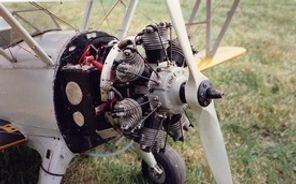 One starts with a basic trainer of about 4 foot wingspan and a 5cc engine. The engines range from powerful electric motors to diesels varying from a single cylinder 5cc to 15cc diesels. Then exotic multi cylinder big engines for models about 8 foot span. These all drive wooden propellers from 10” to 20” diameter and you had better keep your fingers and body well away from these when they were rotating. Finally one can fit a real jet engine for about £2500. 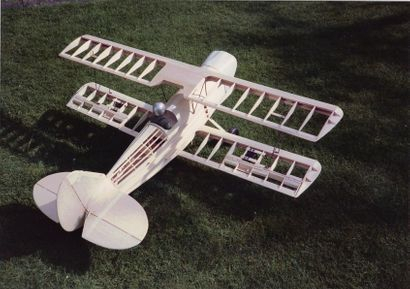 You buy a paper plan and balsa wood in sheets and strips, copy the bits from the drawing- stick them together, fit an engine and radio control gear and you’re ready to fly. One must start under supervision so join a Club with people able to monitor your flying and award an “A” certificate. This enables you to fly without supervision and with a “B” you can fly at public events. I joined the North Hants model flying club but soon moved to RAF Odiham which had acres of tarmac which made taking off and hopefully landing safely so much easier. Altogether I must have built and flown about 25 models including deltas, autogyros and helicopter. Even managed a twin engine version of a passenger plane. 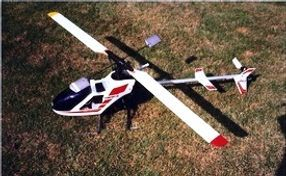 Regrettably I had to have an artificial hip and by the time I got fit enough to fly again the model club had closed since Odiham was the airfield that all the competitors and VIPs landed for the Olympic Games. With nowhere else to fly I had to sell all my models and gear. However until one experiences the ability to make your model do the most complicated aerobatics on a sunny day and then to land smoothly gives one a thrill almost as the best I’ve experienced. So just remember to fly 3 mistakes high to begin with and that accidents in the front seat of a car cause injuries whilst accidents in the back seat cause babies.